Sts. Joseph & Michael church steeple collapsed onto the street below, after the embers from the fire in a nearby house hit the church. With a pain we are reporting that Sts. 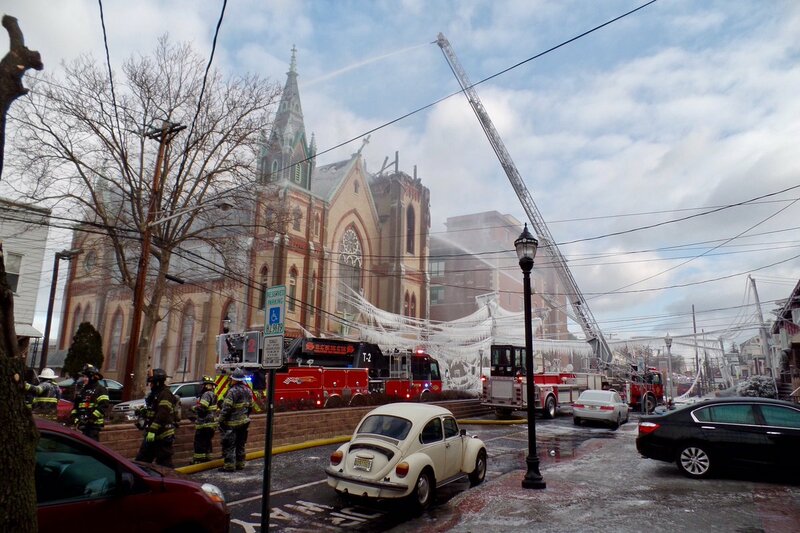 Joseph & Michael Church in Union City, NJ was damaged by fire early this morning on March 04, 2017. Fr. 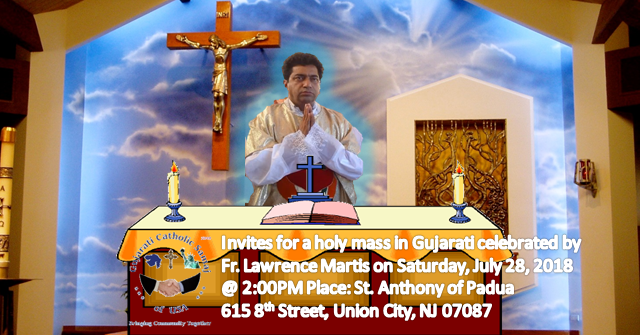 Aro Nathan is a parish priest of the church and very helpful and always allowed us to us his church and hall to arrange a Gujarati Mass for our Gujarati Catholic Samaj of USA. Our prayers are with the church and community. A young boy was killed and his father was seriously hurt in a fire overnight Friday in New Jersey. 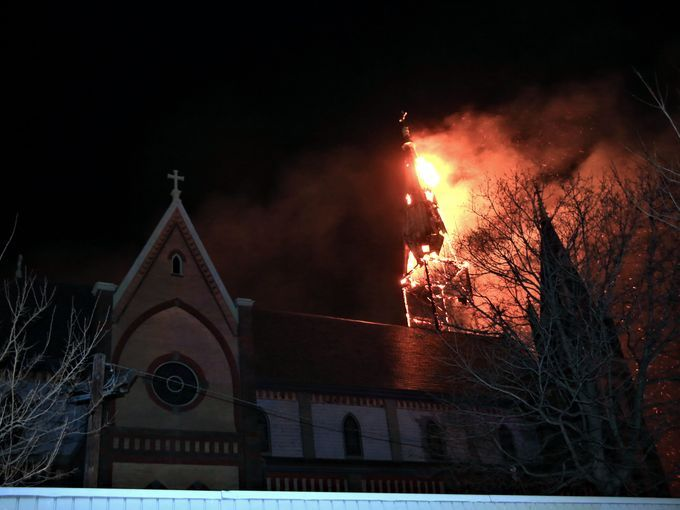 The six-alarm fire ripped through homes and a church in Union City, starting around 1 a.m. It began at a home on Summit Avenue and the wind sent embers to a nearby church, Sts. Joseph and Michael Church at Central Avenue and 14th Street, and surrounding areas. The church has been standing for more than 100 years. Consumed by flames, the church steeple collapsed onto the street below. Power lines also were down in the area. The original fire started a block away at a two 3-story frame houses at Summit Avenue and 14th Street. The child who died was in one of the homes. The fire was under control later Saturday morning, but firefighters remained on the scene to put out hot spots around 8 a.m.
Police are advising motorists and pedestrians to avoid the area. 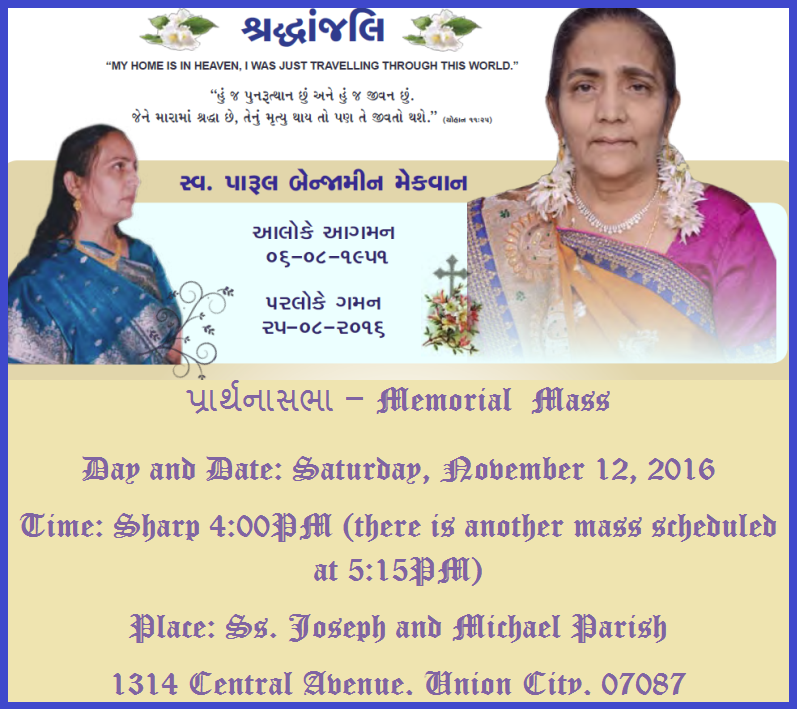 Memorial mass for late Mrs. Parul Macwan the mother of Renison Macwan, celebrated by Fr. Sunil Macwan.